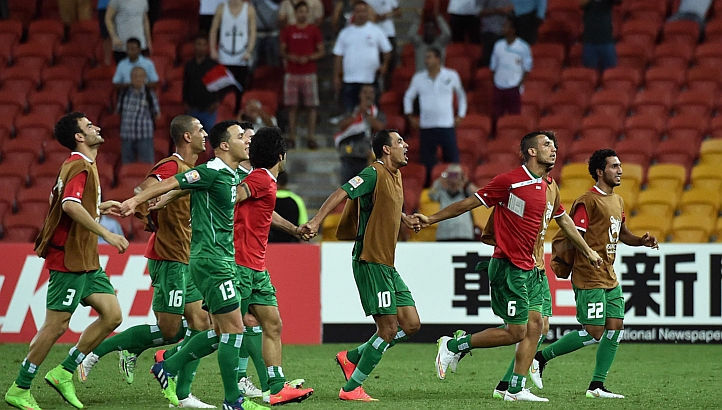 Amro Alkado looks at the semi final from an Iraqi perspective. If you want to check out the other side’s views then check out Tom Danicek‘s write up here. The last meeting of these two sides in the Asian Cup was in 2007 in Kuala Lumpur. It was also in the semi final stage, and Iraq were also huge underdogs. But the unthinkable happened and The Lions of Mesopotamia eliminated South Korea on penalties after a goalless game on their way to winning their maiden Asian Cup title. Iraq are not approaching this one with any delusions though, South Korea are the superior side, and it will take another gargantuan effort if they are to get past them and make a second final in eight years. But strange things happen at the business end of knockout competitions, and that’s why football fans will be tuned in to this match in their droves. A high attendance is expected in Sydney with the large Iraqi diaspora; estimated in the tens of thousands in the city, eagerly anticipating the match up. Iraq play their first game in the city during this tournament and are hoping they can channel the fervour from the stands into a performance worthy of progressing to the final. Shneishel has no injury concerns within the squad, his only obvious conundrum being the absence of influential midfielder Yaser Kasim through suspension. The Swindon town maestro has been a rock in Iraq’s midfield, offering an intoxicating blend of stability and drive when necessary. The obvious replacement would be Osama Rashid if Shneishel is to stick with his thus far trusty 4-2-3-1 but he offers an obvious downgrade and it will be interesting to see how Shneishel reacts tactically. Saad Abdulameer has been the unsung hero in midfield, his anchor role has allowed the likes of Kasim to do the work further up the pitch without worrying about the defensive side of the game. I would be very surprised if at this stage the coach changes tactics at the risk of unbalancing a squad which is slowly but surely becoming more cohesive as the tournament wears on. The only part of his starting XI he has tinkered with regularly has been the three behind Younis, and he has employed six different players in different combinations: Ali Adnan (a thus far converted left back), Justin Meram (who has had an unconvincing tournament and struggled badly against Iran before being replaced), Humam Tariq (who has fallen out of favour since the first game of the tournament against Jordan with an unconvincing performance), Amjad Kalaf (better coming off the bench than starting for me), Alaa Abdul Zahra & Ahmed Yasin. In the four games so far, the coach has employed four different starting variations of that three behind the striker and countless others when you factor in substitutions. We might be more worried about how Shneishel will replace Yasin, but I have a sneaking suspicion his biggest headache may well be selecting who starts in the three behind the striker & in which combination. South Korea on the other hand have the best defensive record in the tournament, with no goals conceded. Iraq have scored six goals so far in the tournament, but they will have to up the tempo in the final third to create more chances in order to unlock a South Korean defence which is looking far more assured now than during that first game against Oman. Both teams will line up in a 4-2-3-1 formation, so indivdual battles will be key. They aren’t the strongest team in the air, and have struggled to really impose themselves in games, but Iraq really have to improve defending crosses/set pieces. Iraq’s main point of attack should focus on the flanks, they have both pace and power with players such as Adnan & Kalaf who would give the likes of Kim Chang-soo & Kim Jun-su problems and we have seen how Iraq caused Iran problems when they attacked down the flanks. Both teams had to play an extra 30 minutes after their respective draws in the quarter finals, but South Korea have the advantage of an extra days rest. The history of meetings suggests games are often tight between the two sides with ten draws in their 16 encounters. How this record will stand in light of this extraordinary tournament so far in Australia will be revealed tomorrow. This is a very young Iraq side, with an average age of just 23, well short of the 27.5 average of all the World Cup winning sides ever. That suggests that this team has another continental tournament in them yet, and an exit at this stage of the tournament would be an honourable one with all expectations already wildly superseded. But their average age belies much experience gained through playing at the U20 World Cup last year for a few of the squad. Their run in that tournament took them to the semi finals after beating South Korea in the quarter final stage, and they lost narrowly in the final of the U19 Asian Cup the year before-against that same South Korea side. While tournaments at full International level are a huge step up, the experience of performing in high intensity & high pressure matches is there for players such as Dhurgham Ismail, Ali Adnan & Humam Tariq. The wise head in the group is Younis Mahmoud, who’s ability to instill calm in the dressing room is cited as a huge factor by Radhi Shneishel himself: “We have a young squad and he is our leader. He is the type of player that opponents hate to play against,” he said. It remains to be seen whether all this early career experience will be a deciding factor in Iraq’s ability to progress. The Iraqi player made noises earlier today indicating he would be quitting competitive football for good after this tournament. Younis Mahmoud is the only player in the Iraq squad who remains from that fabled 2007 team and he seems to be getting a similar feeling again “My memory keeps going back to 2007, I can’t stop thinking about it. I hope it happens again” he told Fifa.com, and who am I to argue with a living legend?